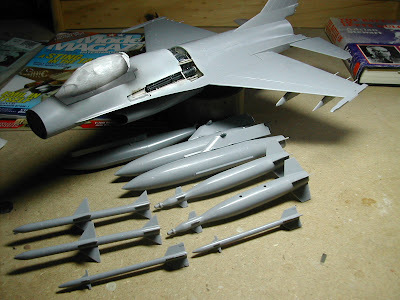 Or how to build an IAF F-16 out of Hasegawa's really old 1/32 scale kit. 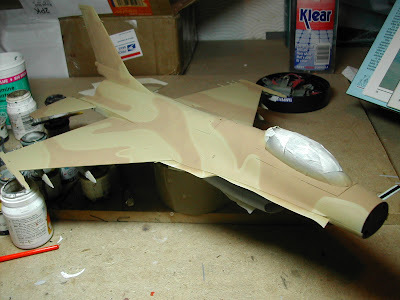 Quite recently I was asked to build an F-16A, and with it was a very nice IsraDecals set. Although the kit dates from way back (maybe the seventies? ), it's possible to make an impressive, up to date job from one these older kits, especially with the quality decals. On examining the kit you can't help but notice the good layout, and the full weapons set, and all those fuel tanks. 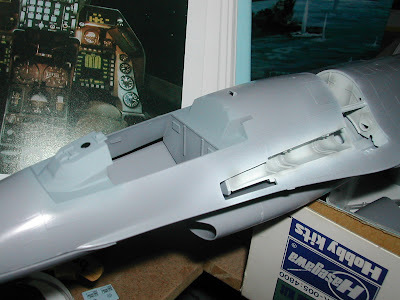 It's been a long time since I had a look at a Hasegawa 1/32 scale jet, but I thought they only gave you the basics in their kit, and sold the ordnance separately. I know that Tamiya's F-16 in this scale is the bee's knees, but then it's a hundred quid, and usually you get what you pay for. Below are some photos so you can see how it's going. 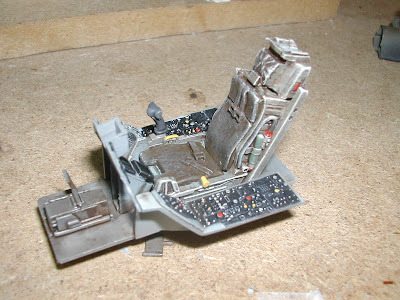 On the box it says F-16A plus, which I assume is because they include a Metal Aces II seat - very nice, better than the plastic one.